Native stories preserve knowledge, traditions, and culture for future generations. Since the earliest days, storytelling taught native people how to live on the land, how to care for it, and how to live with each other. Storytelling continues to be a powerful teaching tool today. Stories are currently enriching the understanding of local San Diego native history, cultural traditions, and ecological conservation in schools. “The Gift Basket”, an original story by Luiseño storyteller Cathleen Chilcote Wallace, illustrates the connections between nature and culture. It stresses the importance of conserving the natural resources so fundamental to local history, traditions, culture and the well-being of future generations. It is the story of a young Luiseño girl, her determination to gather special plants to weave a gift basket for her grandmother, and the animals who help her when she is faced with a problem. The engaging story is filled with cultural information and details. Storytelling presentations can be arranged for classrooms or grade level/entire school assemblies. The presentations align with California State Standards and Common Core Curriculum Standards. The storytelling sessions can be scheduled for 30-60 minutes, depending on the grade level. There is time for questions and discussion at the end of the presentation. A table display of museum quality, native made items used in everyday life such as: hunting and gathering tools, baskets, clothing, musical instruments, games, and native plants. (Small groups will be able to touch some of the items for a tactile experience.) These items integrate with the story, providing context and promoting understanding. An opportunity for students to hear the Luiseño language spoken by the storyteller. This connects the past with the present and encourages cultural awareness. A storytelling session featuring “The Gift Basket” and one or two additional stories as time permits. Fees for The Gift Basket Storytelling Presentation vary. Please contact Cathleen for more information or questions. 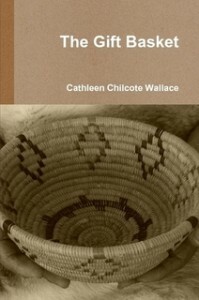 See Teacher Resources/The Gift Basket Book to order copies of the story.